Acquirement or sells, Aristone Conseil proposes a real commercial strategy, builds and leads it, confidentially. Aristone Conseil is a business real estate advisor. We represent and defend our principal, seller or buyer. 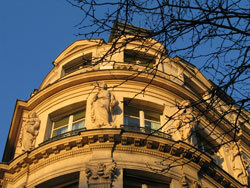 For sells & acquirements, Aristone Conseil set up for his clients a real estate strategy for a win-win deal. Aristone Conseil advice and give assistance to his client from the beginning of the real estate project to the deed of sale. Aristone Conseil may represent autonomously his client during the all negotiation, management and global process following of acquirement and sell. Aristone Conseil makes regular reporting to his clients and does his best efforts to defend his client and report to him the deal processing. Not only a broker, Aristone Conseil uses financial asset-management methodologies (i.e: DCF) and proposes his client, if he wishes it, innovating analysis often including a future strategic plan of asset's valorization. Few sample of focus aims about brokerage.